Seat belts are supposed to restrain passengers in the event of an accident so that they do not hit the inside of the car or get catapulted into the air, causing severe injuries and death. However, our seat belt defect lawyers know that there are numerous ways that seat belts may malfunction. For example, they sometimes unlatch inadvertently. They may detach from the vehicle altogether or tear. Sometimes they are poorly fitting because of a bad design or an improper installation, and they can strangle a passenger or cause other serious injuries in a significant impact. If you or a loved one has been hurt due to a seat belt malfunction, the auto defect attorneys at Moll Law Group are available to pursue compensation for you through filing a claim or litigation. We handle cases nationwide, and billions of dollars have been recovered in cases in which we have been involved. Seat belt injuries usually affect the upper body, but if they break or fail to restrain someone, the result may be an ejection from the vehicle and spinal cord injuries, brain trauma, lower extremity fractures, abdominal injuries, or even death. Depending on the speed of the vehicle, a malfunctioning seatbelt can lead to catastrophic injuries and change a victim’s life forever. In most states, it is possible to hold a manufacturer strictly liable for a defective seat belt or other auto part. When a theory of strict liability is permitted, you will not need to show that the manufacturer's actions fell below a particular standard of care, such that the manufacturer was negligent. Instead, your seat belt defect lawyer will need to show that the seat belt had a defect that rendered it unreasonably dangerous and that the defect caused you harm. Seat belts may be defective due to manufacturing errors, design flaws, or, rarely, marketing defects. Manufacturing errors often occur due to flaws in the manufacturing process. They are typically one-offs, found in one or a limited number of specimens of a particular line. Design flaws, on the other hand, are intentional aspects of the design found in all specimens of that line. Marketing defects are usually a failure to provide warning labels or appropriate instructions. This type of defect is more unusual in a defective seat belt case. If you are able to establish that a seat belt was defective and hold the manufacturer responsible, you may recover compensatory damages. These are damages that are intended to reimburse you for losses caused by the seat belt injuries. They may include lost income, lost earning capacity, medical bills, physical pain, and psychological injuries. In cases of egregious misconduct by a manufacturer, punitive damages may be available to penalize a liable party and deter further misconduct. 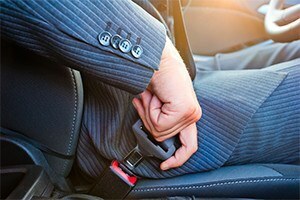 If you are hurt because of a defective seat belt, the seat belt defect attorneys at Moll Law Group are available to submit a claim or sue the manufacturer on your behalf. Our firm represents injured consumers throughout the U.S., including in states like California, Florida, New York, Texas, Pennsylvania, Ohio, and Michigan. Contact us via our online form or call us at 312-462-1700 to set up a free consultation with a product liability attorney.